Home Blood Pressure Kit from PrimaCare has an adult cuff that fits arm circumference of 10"-14". 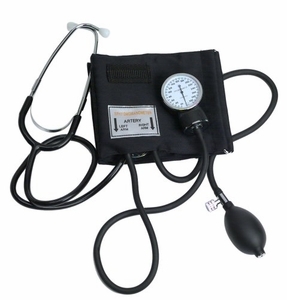 Features soft, comfortable cuff; detached, professional-quality acoustical stethoscope; easy-to-read aneroid gauge; easy-squeeze inflation bulb. Comes complete with carrying bag and instructions. Includes a one-year calibration warranty.